Sarasota Florida Beaches is a great beach travel destination with some of the best beaches of Florida! 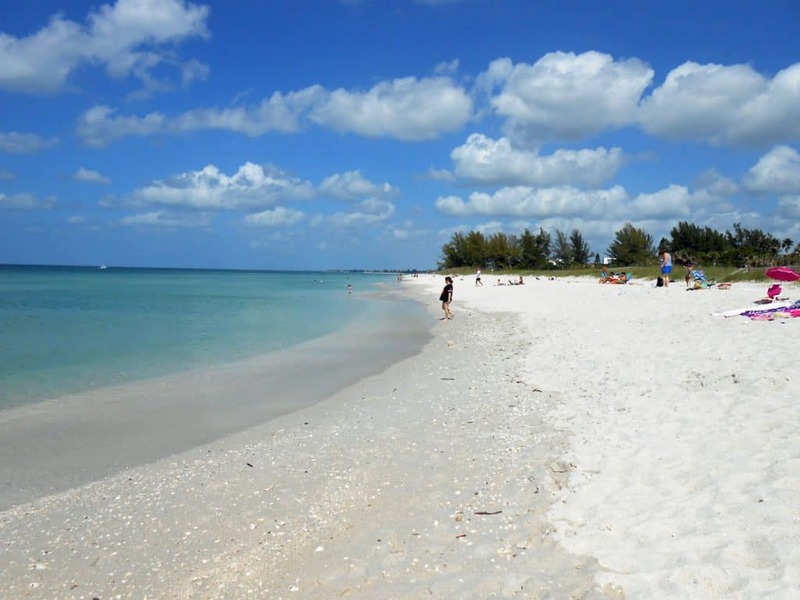 Sun, sand and water are three things Sarasota Florida beaches have an abundance of, but not all Sarasota beaches are the same. 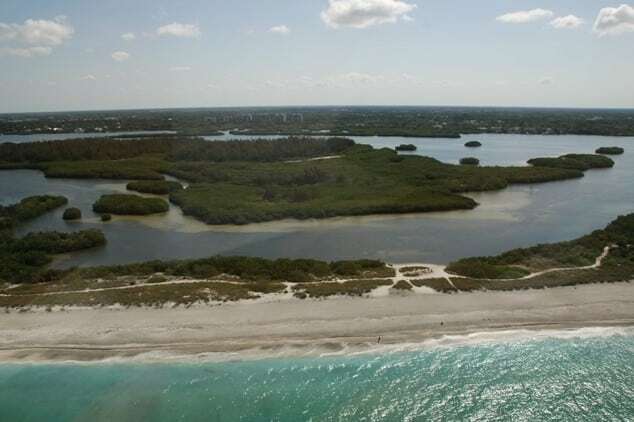 Six islands line Sarasota’s extensive coastline, each revealing its own personality, recreational options and natural beauty. Sarasota Beaches are among the most beautiful in all of Florida and the United States. Siesta Key Beach is rated #3 in a national poll of the Top 10 beaches of the USA. Visit our Sarasota Florida Travel Guide to plan your next beach vacation to Sarasota Florida beaches. Siesta Beach is known as one of the most beautiful beaches anywhere in the world because it has the whitest and finest sand in the world. Siesta Beach is ranked #1 with the 2016 Traveler’s Choice by Trip Advisor, and of course is the top pick of vacationers listed as one of the best beaches of Florida. 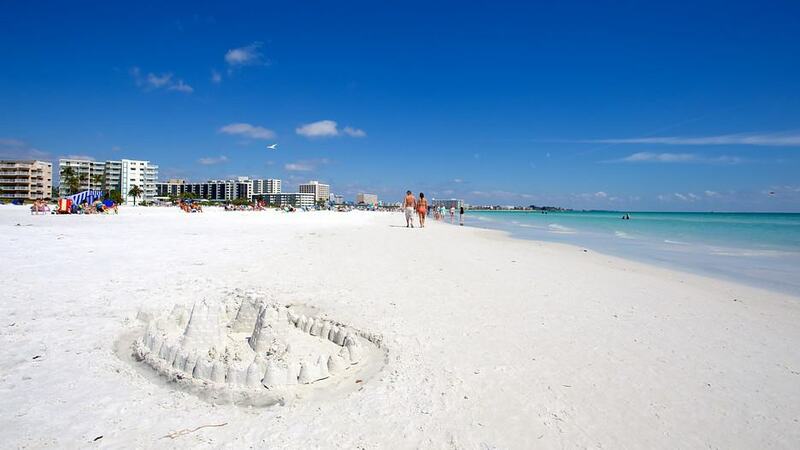 Unlike most other beaches where the sand is made up of mostly coral, Siesta Key beach’s sand is 99% quartz. Even on the hottest days, the sand is so reflective that it feels cool under foot. It’s estimated that the sand on Siesta Beach is millions of years old, and started in the Appalachians and flowed down the rivers and was eventually deposited on the shores of Siesta Key. The water here is shallow near the shore with year-round lifeguards, which makes this beach one of the safest beaches in the Sarasota area. There is a LOT of parking for this beach, but they fill up quickly, so get there early. If you are staying on Siesta Key, then there are lots of access points and you can walk to the beach without the worry of parking. 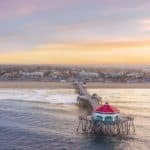 Services include restrooms, picnic tables, volleyball, tennis courts, concession stands, lounge & umbrella rentals, playground equipment, and outdoor showers to wash off the sand. Every Sunday night, the Siesta Key Drum Circle attracts musicians, dancers, beachgoers and certainly its share of regulars. Folks gather with drums, maracas and tambourines to fill the evening air with enchanting sounds. Dance along or bring a blanket and drift away to the music. With the sand beneath your feet and the sun setting over the water, you can afford to go (it’s free, of course) and you can’t afford to miss it. Visit our Sarasota Florida Travel Guide to plan your next beach vacation to Sarasota Florida beaches. 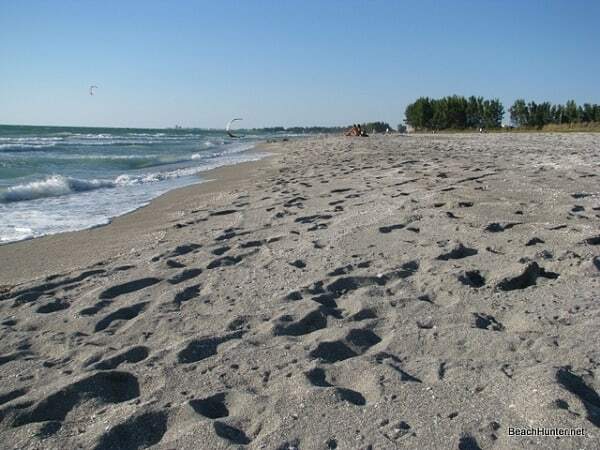 Whitney Beach is approximately a quarter mile long located on Longboat Key. This pristine beach extends southward behind several condominium residences with public parking nearby. There are plenty of vacation rentals here with luxury high-rise condominiums, tennis & golf resorts, vacation rental condos, to apartment efficiencies and single-family homes. The island has no billboards, neon signs or shopping malls. There are up-scale shops and Zagat Rated restaurants located on this island of paradise. If staying on the island, leave the car behind and hop a Trolley running north and South on Gulf Drive to more beach and shopping districts with stops at Mote Marine Lab, St. Armands Circle and downtown Sarasota. Daily service runs from 6am to 11pm every 30 minutes. Visit our Sarasota Florida Travel Guide to plan your next beach vacation to Sarasota Florida beaches. 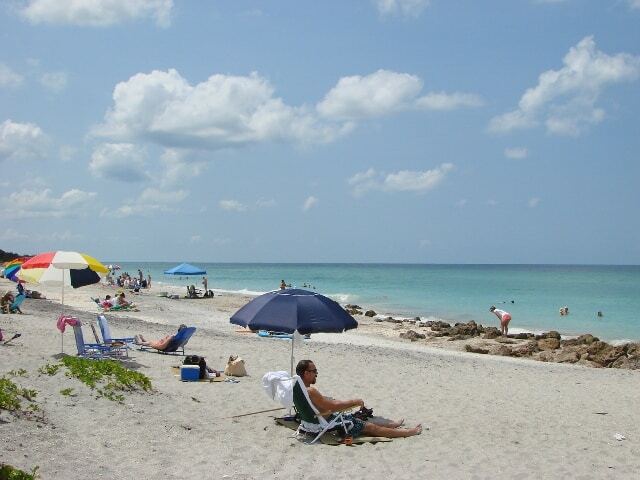 North Lido Beach is located on Lido Key, one quarter mile northwest of St. Armands Circle, off of John Ringling Blvd. There is a very small parking area at the north end of the beach. The beach is easy to get to and very private. There are no lifeguards on duty at this beach and the currents are very swift. Not the best beach for small children. The beach is maintained in a natural state and features a dune system that is home to many nesting shore birds. There are no amenities at this beach. Visit our Sarasota Florida Travel Guide to plan your next beach vacation to Sarasota Florida beaches. Lido Beach, like North Lido Beach, is located on Lido Key. Lido Beach is very popular and attracts visitors from all over the world. 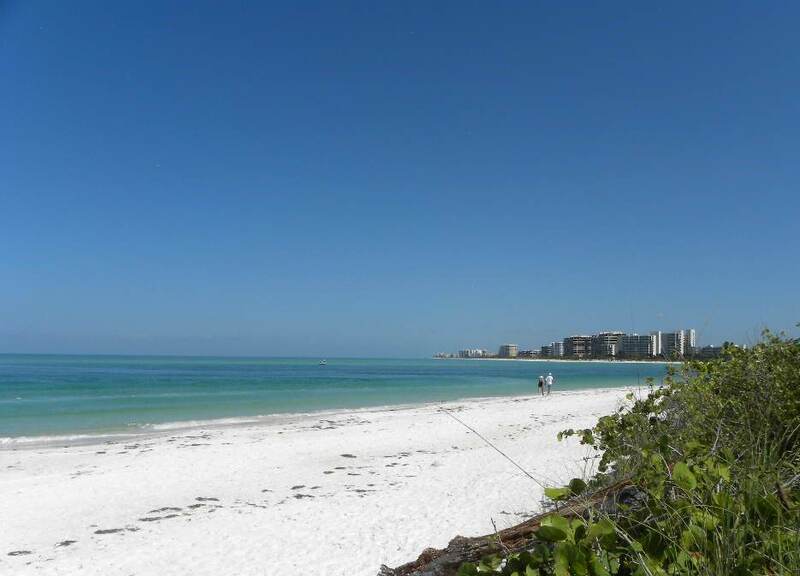 There are a number of hotels, motels and private condos for rent on Lido Key. While the beach isn’t as large as nearby Siesta Key Beach, many like Lido Beach more for being more relaxed and less crowded. Lido Beach is within the city limits of the City of Sarasota while Siesta Beach is in unincorporated Sarasota County. You can reserve sections of the beach for large private parties and weddings. Services at this beach include restrooms, concessions, a gift shop, a meeting room, playground, beach umbrella and chair rentals, plenty of parking, a heated swimming pool, and outdoor showers. The Seabreeze Concession or Lido Beach Restaurant serves very good food. All food is cooked to order, including hot and cold sandwiches, burgers, dogs, fries, beer, and wine. There is also the Lido Beach Casino located here. Visit our Sarasota Florida Travel Guide to plan your next beach vacation to Sarasota Florida beaches. North Jetty Beach Park is located at the southern end of Casey Key. Services include free parking, lifeguards, concessions, bait shop, volleyball courts, a playground, picnic tables, showers and restrooms. Fishermen cast their lines from the rocks, wave to passing boaters and watch dolphins cavort in the channel. Families, after a leisurely picnic in the Shade of Australian pines, head over the dunes to pitch colorful umbrellas on the sandy beach. 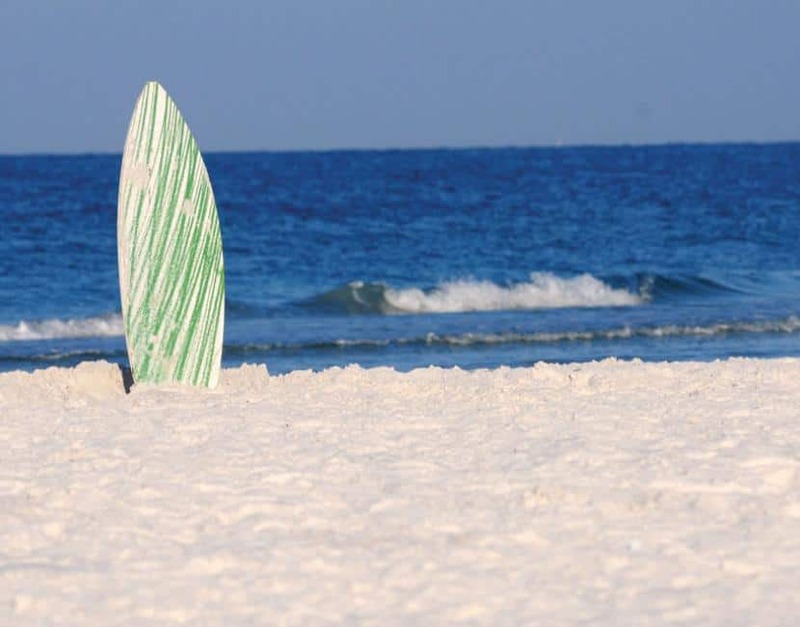 And, bring that surf board for this is one of the better surfing spots along the Gulf Coast. The vacation rentals on Casey Key vary from “old Florida” apartment efficiencies to rental condominiums. The atmosphere is extremely casual with several good restaurants across the bridge. 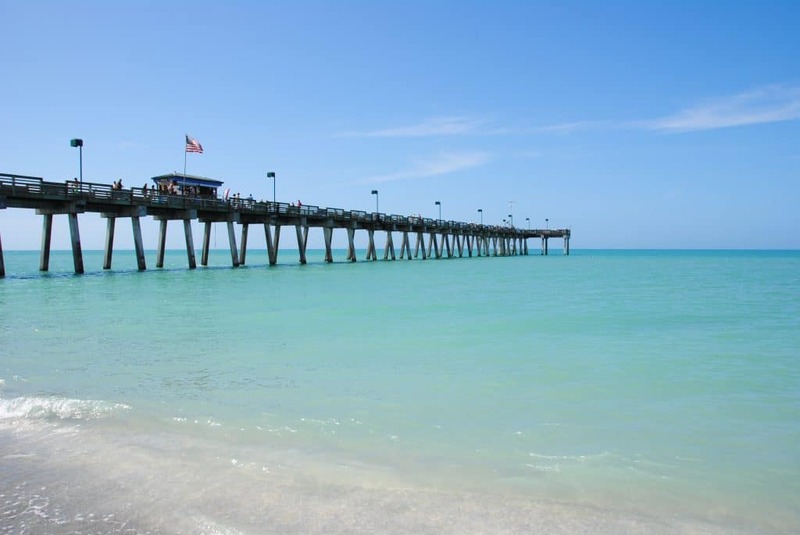 Famous for having a great shopping district, Historic Venice Florida is just south of the island. Visit our Sarasota Florida Travel Guide to plan your next beach vacation to Sarasota Florida beaches. Nokomis Beach features 20 unspoiled acres of sea grapes and Australian pines. Services include a boat ramp, fishing sites, a children’s playground, free parking, lifeguards, restrooms, picnic tables with grills and showers. Walkovers to the beach are bridged by boardwalks traversing the dunes. Spectators can observe breathtaking sunsets from gazebos and benches strategically placed along the walkway. A concession stand and bait shop can be found at nearby North Jetty Park. There is Ample Free Parking, but be forewarned, …weekends are crowded so, arrive early. The vacation rentals on Casey Key vary from “old Florida” apartment efficiencies to rental condominiums. The atmosphere is extremely casual, with dining and shopping immediately across the bridge or in Sarasota or Historic Venice. Visit our Sarasota Florida Travel Guide to plan your next beach vacation to Sarasota Florida beaches. Brohard Beach & Paw Park provides special amenities exclusively for your furry best friends. Brohard Beach and Paw Park is one of the most popular beaches and parks in the area. Your canine buddy will appreciate the doggie drinking fountains and dog-only showers. On one section of the beach, dogs can run free or chase tennis balls or Frisbees; there’s even a spot reserved for your pet to go swimming. 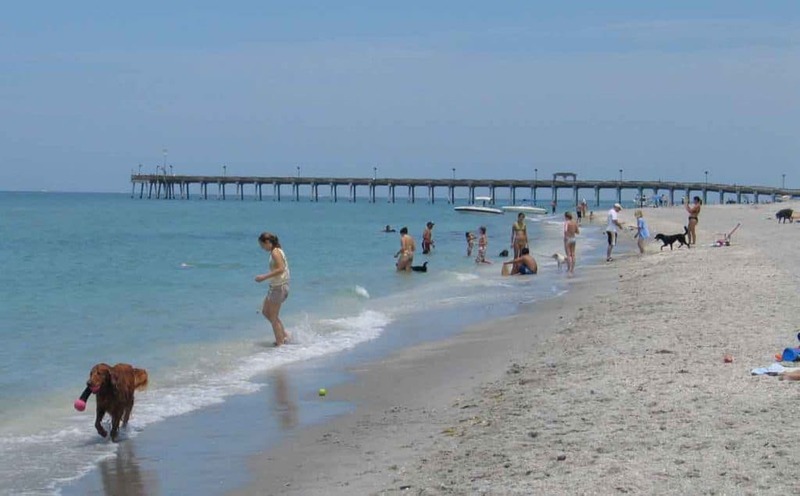 Brohard Beach and Paw Park sits on 89 waterfront acres on the majestic Gulf of Mexico, immediately south of the Venice Fishing Pier. You’ll also find plenty of delights there for yourself and your fellow humans: a bait shop, a snack bar, and complete picnic facilities. Brohard Beach is immensely popular with sharks’ tooth collectors and shell collectors, and it’s the ultimate location for viewing spectacular sunsets on the Gulf. It is a family-friendly beach and park, and it’s completely handicapped-accessible. For the safety and comfort of pets and people alike, Brohard Beach & Paw Park is smoke free, and no glass bottles or containers are allowed. The beach and park are open daily from sunrise to sunset. Visit our Sarasota Florida Travel Guide to plan your next beach vacation to Sarasota Florida beaches. Directly across from Venice’s shopping district, this large public beach which provides free parking, a dining pavilion, concessions, lifeguards, restrooms, picnic tables and beach wheelchairs. Scuba divers can explore the reef a quarter mile from shore while beach dwellers can sift the sand for Prehistoric sharks’ teeth. This is a popular beach with limited parking, so arrive early. The vacation rentals in Venice vary from apartment efficiencies, hotels and motel rooms to rental condominiums. The atmosphere is casual with plenty of good restaurants and excellent shopping. Visit our Sarasota Florida Travel Guide to plan your next beach vacation to Sarasota Florida beaches. 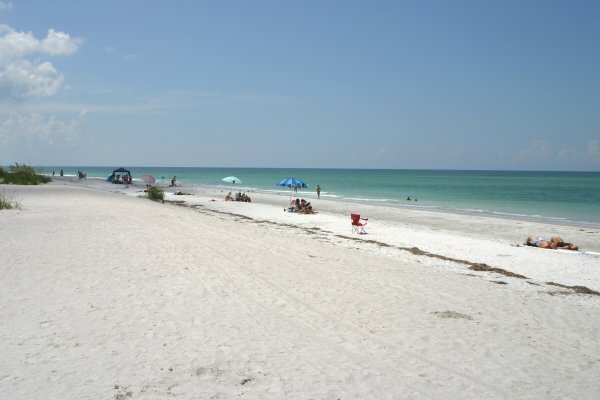 Coquina Beach is the longest stretch of beach located on Anna Maria. Services include free parking, lifeguards, concessions, picnic tables, a playground, restrooms and showers. Remnants of old piers jutting out into the water make it awkward for running, but a choice spot for surfers. It’s also the place where you’ll mostly find younger groups of people gathering around a boom box, sunbathing, or playing frisbee on the sand. A boat launch is across the street as well as Coquina BayWalk at Leffis Key where footpaths and boardwalks lead visitors around tidal lagoons and mangrove shoreline. Dolphins are often sighted not far from fishermen doing some fishing of their own. There is plenty of sunshine and breathtaking sunsets! Visit our Sarasota Florida Travel Guide to plan your next beach vacation to Sarasota Florida beaches. 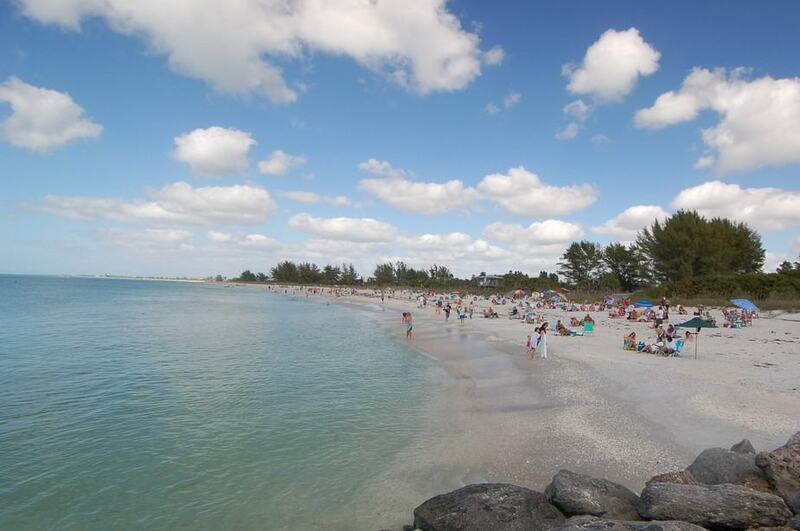 Caspersen Beach is the southern most of the beaches in this area. It is preferred by those looking for more shade and the variety of rock outcrops along the beach. The rough rock outcrops that intrude here and there on the fine sand of the beach are tough on the feet, but they break the waves that wash onto the beach. This attracts fish and the fish attract Florida’s wonderful fishing birds, including herons, Great Blue Herons, and diving pelicans. The breaking of the waves also gathers sharks’ teeth into concentrations making them easier to find. 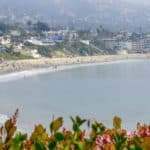 Services include restrooms, outdoor showers, raised walkways, and several parking lots, including one very close to the beach reserved for handicapped access. Visit our Sarasota Florida Travel Guide to plan your next beach vacation to Sarasota Florida beaches. At the southern end of Siesta Key is Turtle Beach. This is a great beach for families. The sand is a bit coarser and the beach drops off more dramatically, but that means the snorkeling and shelling is better. Services include restrooms, a building for meetings, boat ramps, large group picnic shelters, small picnic shelters, horseshoe courts, volleyball, playground equipment, and dune walkovers. It may not be as popular as Siesta Beach, but if you can’t find a parking space at Siesta Beach, Turtle Beach has plenty of free parking. Boaters can enjoy parking their trailers and launching boats into the lagoon for a day on the water. 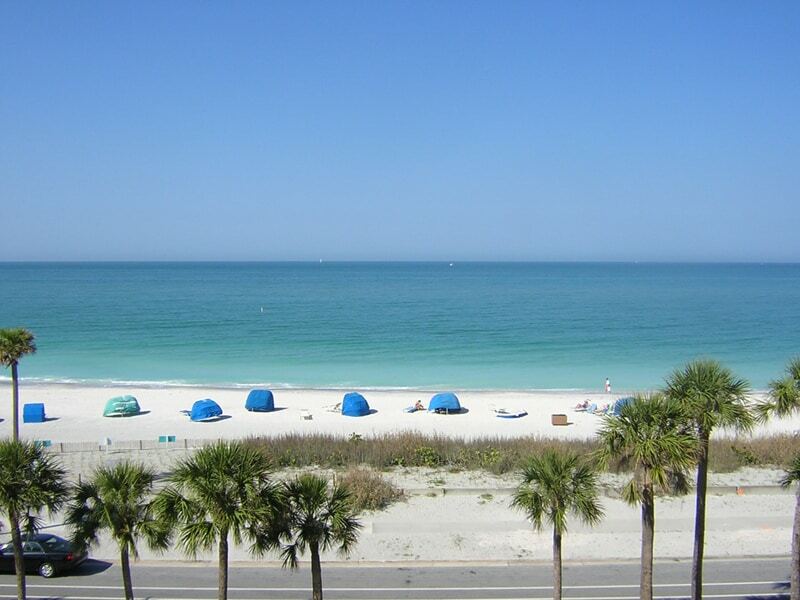 The vacation rentals in this area of Siesta Key are numerous and varied. From luxurious resorts, rental condominiums & villas to apartment efficiencies and motel rooms, most offer private beaches or beach access within a short distance of Turtle Beach. Visit our Sarasota Florida Travel Guide to plan your next beach vacation to Sarasota Florida beaches. Palmer Point Beach begins at the southern tip of Siesta Key and continues onto the north end of Casey Key. The beach is a popular spot for boaters and people who walk there from Turtle Beach seeking some privacy.There are no lifeguards and no facilities. The beach is a favorite spot for kayakers and fishing. There is no parking and it is only accessible by walking north from Casey Key or south from Turtle Beach at the end of Blind Pass Road. Visit our Sarasota Florida Travel Guide to plan your next beach vacation to Sarasota Florida beaches. Wow! Too beautiful to look at and read about! Would be a dream to go there one day! This is a superb guide as to what to expect, and which beaches are child-friendly and so on. It looks like paradise – thanks for the wonderful descriptions. You are welcome Natalie 🙂 It IS paradise, but then I will say that about any Florida beach as I absolutely love it. Thanks for visiting Sarasota Florida Beaches! OMG, a super awesome website! I love beaches and I love the ocean. Your photos are really fantastic! I am ready to head to Sarasota! Thank you Peter! Yes, as you can tell I love the beaches and the ocean as well 🙂 Let me know if I can help you plan your trip to Sarasota for some beach time. To be honest, I have never been to beaches and I always wanted to go there. But I live in a landlocked country and my parents don’t travel far. But seeing your pics and explanation on those beaches makes me feel to go on a weekend. Hope I will manage it on a holiday. Loved your article, thanks for sharing. You are very welcome Ravi 🙂 That is my whole intent, is to get people interested in beach travel. I think it is pretty amazing and Florida beaches are so laid back and awesome! Siesta Key is going to be the best bet for seeing the turtle nesting. It is quite a wonderful site. So that on top of the beautiful Sarasota beaches can’t be beat! Thanks for visiting Brandon! Very nicely laid out. Nice Balance. I have been wanting to visit Sarasota for quite some time and glad I found your information! What is the best time of year for nice warm weather and water? Thank you Chappy. If you want the warmest weather and water, then I would go May thru August. It is still warm from March thru October, but the water is a little bit chillier. All this beach talk makes me wanna go really bad. I will definitely keep these in mind the next time I plan on going on a vacation. As a beach lover, I enjoy perusing this website. Wonderful gorgeous photos. I love the Florida beaches. I attended college on the East Coast of Florida, so I can appreciate the many qualities of the Florida beaches and especially those in the Florida keys. Beautiful website. Wow! What great beaches! And what a terrific post to explain them. Thank you for the fact filled information, what amenities they offer, and especially the gorgeous photos of the beautiful white sand locations! The Siesta Key beach life video was awesome! Really shows just how spectacular this destination is! The sand sculptures alone were beautiful! Love the rows of dolphins! 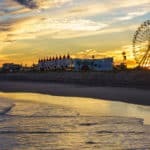 I travel to Florida (usually Orlando) but have never visited ANY of these beaches. Will need to make that happen during a future trip. Wow so many places to choose from. I have copied and pasted your post in my travel plan book so now I know where to go to Florida. Thank you for sharing your information. Very clear and informative. Wow! Thanks for all the descriptions and videos. Really great for preparing a trip and deciding where to go. Of all the beaches you mentioned, which one that you would truly recommend people to unwind? I don’t like crowded beaches where people just running around and screaming. I enjoy relaxing at rather quite place. A quite beach can let you listen to the sound of the waves. It will let your mind wander free. For Sarasota beaches I’d have to say Palmer Point Beach or North Lido Beach. Generally those with no services are quieter. What a lovely website! So easy to navigate and I am so ready for a vacation : ) I loved the Youtube video, that was a nice touch. These beaches all look and sound so lovely, I’m not sure which one I’d choose. Loved reading your page. HI thank you for all the information you have and I just wanted to say I live in central florida and all these beaches are great siesta key is beautiful. If anyone has not been you should. Thank you Leahrae for this post! My wife and I are starting to look for our vacation and we were not sure where to go. Your beaches description gives us new ideas! This post just made me realise how long its been since I’ve been on holiday, I keep telling myself I’ll get round to booking something but never do. Think I’ll have a cherry pick of all the good spots on here and make a list. Great reviews of each beach. I am very impressed. I don’t get to go the beaches very often, but the next time I go, I’ll be sure to do my research through your site. Great job! I so wish I could be on a bean right now! 🙂 Really great pictures. This is a great list of the different beaches, definitely might have to think about planning a holiday around one of these beaches soon! This is a great summary of the feature offered at Sarasota beaches. Siesta Key Beach looks wonderful. I always look for a beach with plenty of services, so you can spend the day there without worrying about finding a bathroom, getting something to eat and drink and shower the sand off. Of course, it’s always smart to arrive early for the best parking and spot on the beach. The Sunday night Siesta Drum Circle would definitely be something to see. Thanks for all this information. The beaches are so inviting to go to. I have never been to Florida but I can see why it’s very famous to a lot of people and always being shown on TV. 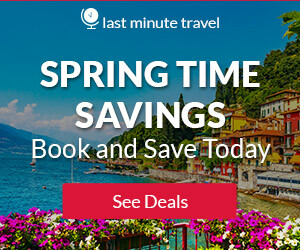 Now that it’s coming to spring time, I am sure your post will excite a lot of your readers to start planning the best time of the year. I liked the description of them all and the video. I just can’t decide which one would be for me, but being spoilt for choice is not a bad thing. Had no clue of Whitney and Lido so I am extremely excited to check them out. I really liked your article, it give my mind the freedom to flow and kinda imagine myself at these beaches 🙂 I especially liked the Palmer Point Beach. The video was fantastic, you did a good job here !! Very nicely explained ! And the addition of the youtube video is also a good thing ! All in all , a good site ! Keep going and all the best !